Last week we asked about your church marketing hopes and dreams for 2007. The perennial favorite, a web site that doesn’t make people cringe, took the top spot with 34%. Next came the novel concept of planning with 25%, followed by braqnd consistency at 21%. 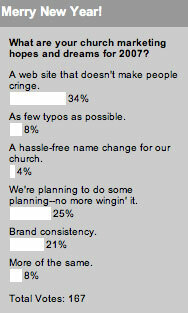 More of the same and as few typos as possible tied for 8%, and only 4% are planning a church name change in 2007. May all your church marketing dreams come true in 2007. This week we’re asking about newspaper advertising.